Citation: C N Trueman "Bull Connor"
Theophilus Eugene “Bull” Connor is most associated with the civil rights demonstrations in Birminghamwhere to many the very public role of Connor and what took place in Birmingham seemed to epitomise the racial problems that existed in the South. Theophilus ‘Bull’ Connor was born in Selma, Alabama, on July 11th, 1897. Alabama was a hard-core Confederate state which was still coming to terms with the end of the American Civil War and the emancipation of the slaves. The KKK was strong in the state and the ‘Jim Crow’ laws were rigidly enforced. Lynching was a common way of keeping the African-American community ‘in their place’ and those responsible invariably simply got away with their crime. However, Connor only spent the first eight years of his formative years in Alabama. His mother died when he was eight and his father, a railroad engineer, travelled around America looking for work. Connor’s father claimed to have worked in 30 different states. Connor’s schooling barely existed and he did not graduate from high school. However, his father taught him how to read telegraph ticker reports and this got him work in the early radio stations. Returning toBirmingham, Alabama, Connor became a sports broadcaster. He gained quite a lot of local fame doing this work and he tried to get into politics. Connor was elected to the Alabama legislature in 1934 and in 1937 he became Commissioner of Public Safety in Birmingham. He held this position, on-and-off, until 1961. 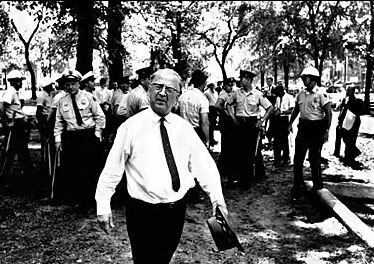 He gained a reputation for being an outspoken segregationist and this gained him a lot of support in a city where segregation was rigidly enforced and where attempts were made to keep the state so despite federal legislation such as Brown v Topeka in 1954 and the end to bus segregation after the Montgomery Bus Boycott of 1955-56. 1963 was a pivotal year for both Connor and Birmingham. Martin Luther King organised a civil rights march in the heartland of a city that was openly segregationist. It could only lead to trouble – and trouble duly followed. Connor saw the move by King as being a direct challenge to his authority within the city. Those who demonstrated faced high pressure hoses and police dogs. The images were shown around the world – of unarmed demonstrators who were non-aggressive being attacked by the police. It could have only done the civil rights cause a great deal of good and brought international and national shame on Birmingham. The irony is that the black population of Birmingham was wary of supporting the march as they knew that it was likely to provoke a response from Connor. They also knew that they would still be in the city when the likes of King had left and that it would be the black community that would have to suffer the long term consequences. Many of those on the march were ‘imported’ and the dearth of adults was such that King used children on the demonstration to give the appearance of bolstered numbers. However, the images of children being attacked by those who were meant to maintain law and order did a great deal to damage Connor. It has also been argued that J F Kennedy was so outraged by what was seen on television, that what Connor led helped to accelerate what was to become the 1964 Civil Rights Act. There were those in Birmingham’s city hierarchy who felt that Connor was a throwback to times that had passed and was an unwanted symbol of hard-line Southern racism. In 1963, Connor was ousted from power – a decision that was upheld by the state’s Supreme Court in 1964. A quiet but powerful group of local businessmen had become concerned that the international attention that Birmingham and gained, and the associated notoriety, would seriously hinder any outside investment into the city that was needed at the time. To get back into some form of power within the city, Connor ran for President of the Alabama Public Service Commission. He won his first four-year term in 1964, was re-elected again in 1968 but lost his re-election battle in 1972. He retired from politics in 1972 and died on March 10th, 1973.